Home / How To / Online Tools / how to Create A text image with 3D-style Online. how to Create A text image with 3D-style Online. 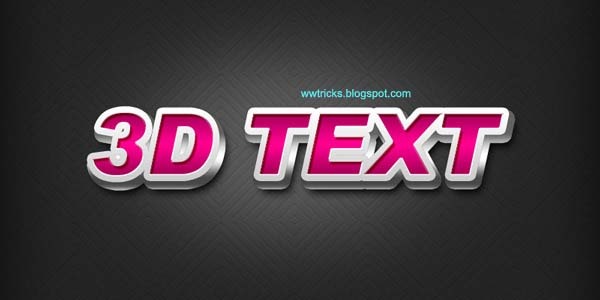 It is very easy to create your own choice of text image with 3D-style. There are many websites who gives you these services. So if you want to create your own text image online then you are in the right place, we will show some websites having these type of online tools such as free online photoshop. After reading and following the instruction of this post, you will be able to make your own stylish image. Note that you can also use photoshop online tool for such creation. in this website i'm telling about, you can select your choice of style as you will see there and can colorize etc. This is an ads-free text image. you know you can use many websites for this purpose but some of them also show there own name(Ad) with in. 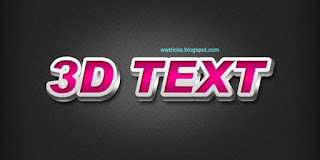 So follow these steps to make an stylish text image. STEP-2: After going on this link you can choose the rendering style of the text,3D Model,So choose one of the available. !.change sample text with your own(i.e WWTricks). 2.Font size, Big or Normal. select one. 5:Margin: you can choose margin. 6.Background color: This will be html style codes so choose your own choice. After that choose a font from the given fonts. So after choosing this and and all the process click on Culculate Effect. you will see your image is created. i created just a simple image for example as given below. You can allow shadow effect to make it more beautiful. Telehealth: How it is helping patients to improve their health condition?